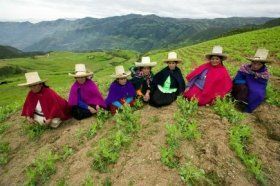 Carleton University students are consulting with small-scale farmers in Peru as part of a partnership with the international development organization Cuso International. Students in the Bachelor of Global and International Studies program (BGInS) at Carleton University are gaining hands-on experience while improving food security in Peru thanks to an innovative partnership with Cuso International. The partnership, which began in January, is the first of what Cuso International hopes will be a new wave of e-volunteering opportunities for students at Carleton and across Canada. Through this new program, 21 Carleton students are using Skype, email and other communication technologies to work with professionals and community leaders in Lima to help small farmers generate income in an urban setting. The students provide research and project design support, and develop strategies and products for the farmers.